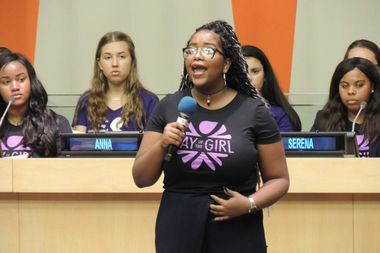 Eva Lewis speaks at the United Nations International Day of the Girl event Monday. SOUTH SHORE — Eva Lewis is back home now after sharing her compelling message about empowering black girls at the United Nations International Day of the Girl event earlier this week in New York. The 17-year-old South Shore resident was invited to speak at the event after gaining media attention from a July rally at Millennium Park she helped organize with three other teens. It was her second time in New York City. Eva participated in the United Nations’ 60th Annual Commission on the Status of Women in March, but this time it was much different, she said. “This was a much bigger event, with a lot of people watching all over the world,” she said, adding that at least 1,000 people were in the audience. Eva, who attends Walter Payton College Prep, opened up the event with a spoken word performance. Eva also spoke at the event. The marginalization of women, especially black women, is an issue close to her heart. There hasn’t been a shift in the conversation to truly address the inequalities that black women and girls experience, Eva said. Issues like hypersexualization, human trafficking, sexual assault and domestic violence disproportionately affect black women, she said, but the main people speaking up about those issues are black women. Her mother, Valerie Andrews-Lewis, and grandmother sat in the audience. Andrews-Lewis said she hopes some policy changes will occur from the message her daughter is spreading. Eva has been a member of the Girl Scouts since she was 7 years old and the organization has really helped her create a platform and spread her message on a larger scale, she said. Without Girl Scouts, Eva said she probably wouldn’t have been invited to speak at the United Nations. Now that the event is over and she’s back in Chicago, her plan is focus on her nonprofit The I Project, which she created more than a year ago. Eva said she will also continue community activism and encouraging others to get involved. She’s looking forward to attending college and studying English, film and African-American studies or women’s studies. Eva said she'll continue speaking when the opportunity presents itself. "I’m very privileged in that I’m from a low socioeconomic neighborhood and being a black girl," she said. "So these opportunities are kind of coming to me because of the work I’m doing, which is really humbling. I'm going to continue using these platforms in a productive way."